Posted on: March 26th, 2019	by Jennifer A. Last weekend, I passed this playground 4 times while driving around for street hockey tournaments in Bellmawr. The colorful climbing structures of the Scott E. Merulla Playground stood out from the road and I knew I had to stop by to check it out. Thankfully, when the games were all over, the sun was still out and my youngest agreed to check it out. We both loved it! I’m not sure which climber we loved the most. Truth be told when it was time to go I had a hard time getting my son to leave. Take a look at the details about this Bellmawr playround including our video and pictures. 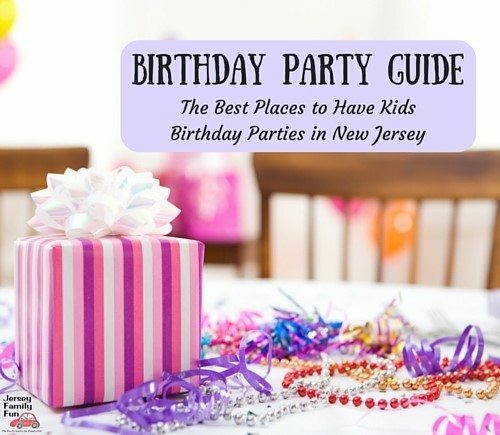 Let us know which area your kids would love most. We’re sure they will love it as much as we did. Sitting in the O-Zone Climber at Scott E Merulla Playground in Bellmawr. 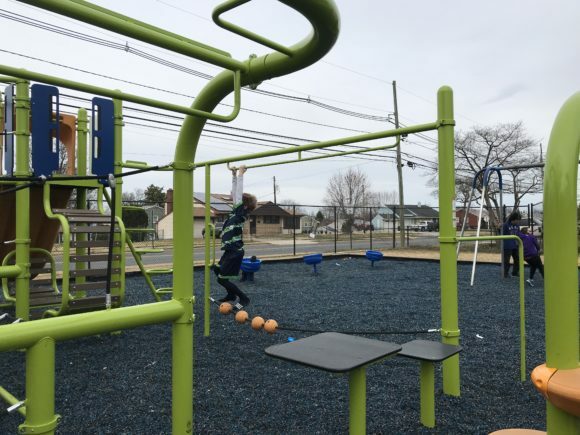 The Scott E Merulla Playground in Bellmawr is located at the intersection of Creek Road and S. Bell Road. 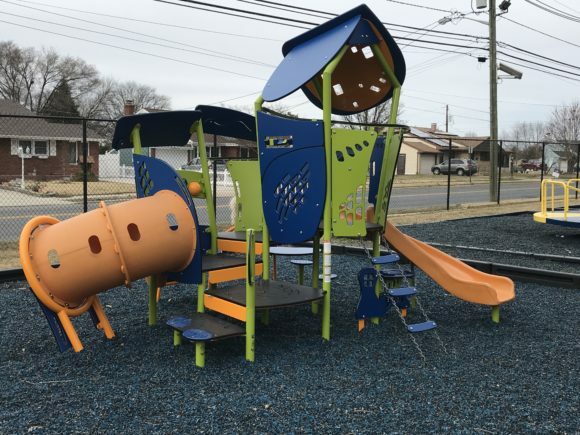 Parking for this Bellmawr playground is available in a small lot on Bell Road adjacent to the basketball courts. 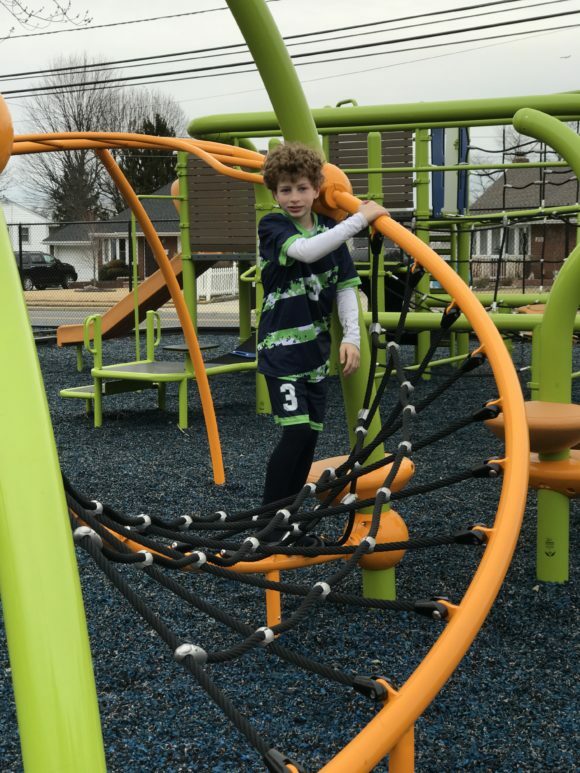 The O-Zone Climber at the Scott E Merulla Playground. 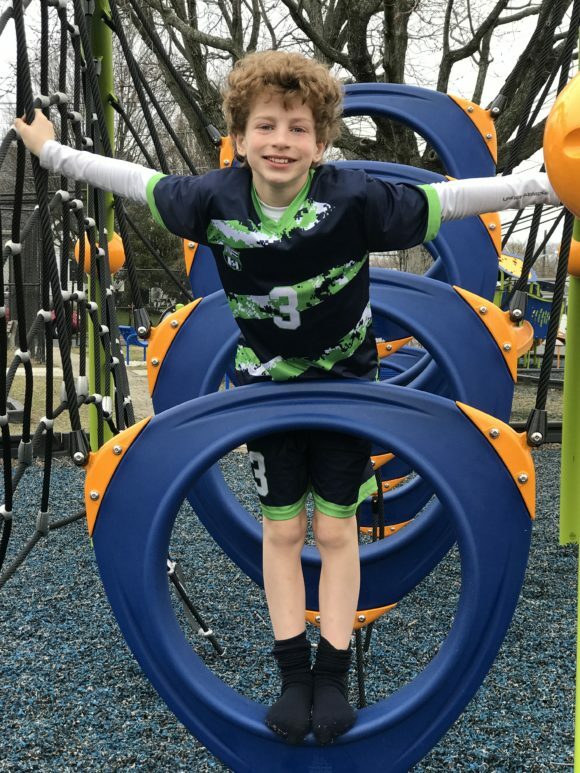 We know parents want to know what kind of playground equipment Scott E Merulla Playground has. 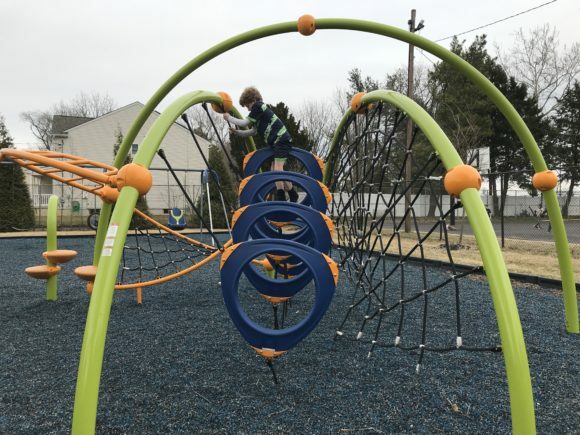 From swings to climbing structures, slides to benches we help you get to know Scott E Merulla Playground through our details, video, and pictures below. 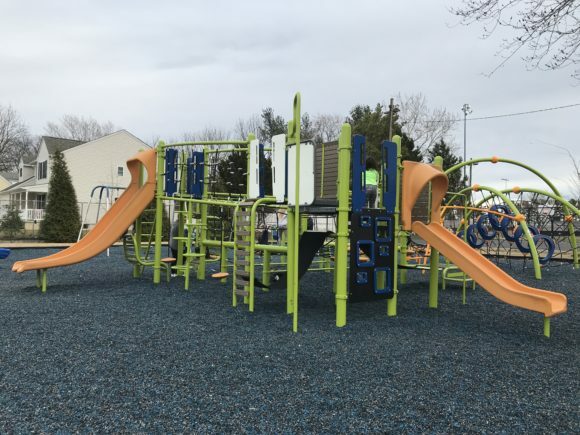 Some of the playground equipment featured is from Landscape Structures Inc.
What are the Scott E Merulla Playground hours? The playground is open from dawn to dusk. Does the Scott E Merulla Playground have bathrooms? We did not see any bathrooms at the Scott E Merulla Playground on our visit. However, there was a building, in the distance, near the baseball fields, that may have bathrooms. 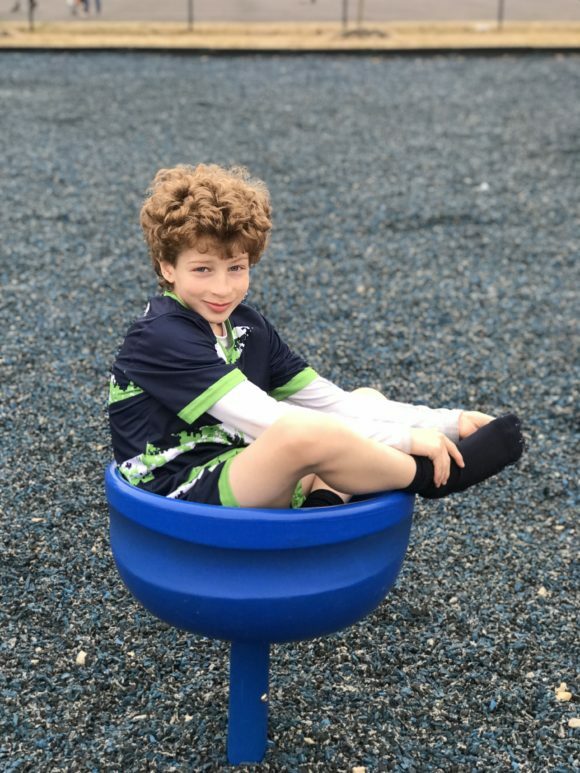 The Scott E Merulla Playground in Bellmawr has 3 spinning buckets like this. Does the playground have tables and pavilions? We did not see any tables or pavilions at the Scott E Merulla Playground. There is limited shade, in a seating area, underneath the main slide, of the larger playground climbing structure. 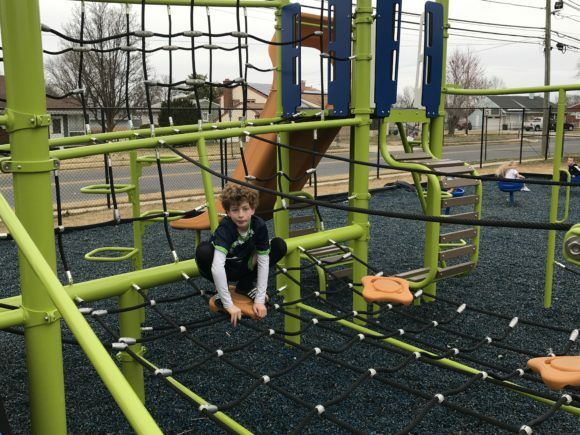 The Scott E Merulla Playground equipment includes 2 playground structures and multiple ways for kids to climb, play, and spin. Each play area is enclosed with molding and the surface area is recycled tire mulch. The entire playground area is fenced in as is each court. 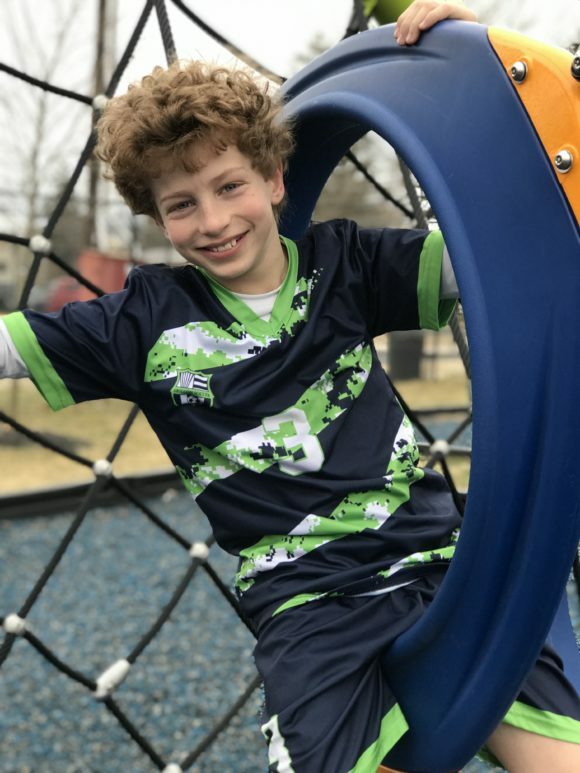 Watch our video with highlights from Scott E Merulla Playground below. The Scott E Merulla Playground in Bellmawr even has an old-fashioned Merry Go Round for kids to spin. There is a preschool area for kids from 2 – 5 years old. The first playground features a preschool play area for kids ages 2-5 years old. The play area for kids 5-12 years old. The second playground is larger and for older children. There are so many ropes for kids to climb across. This climber is called a Flex Climber from Landscape Sculptures. I’m calling this one the tight rope as my son crosses it. The playground comes equipped with fields for basketball, baseball, and volleyball in the sand. 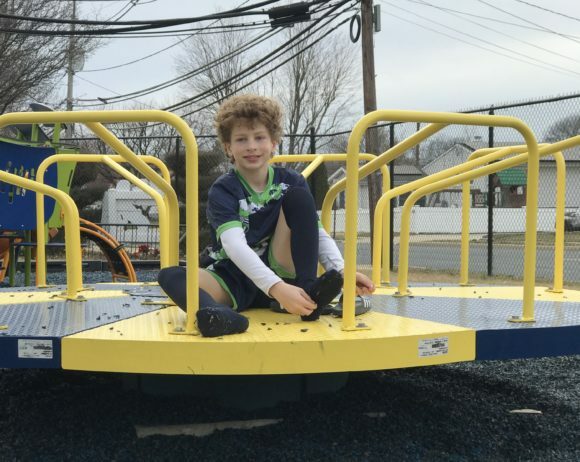 Click over to find more Camden County playgrounds or New Jersey Parks & Playgrounds. Connect with local families in our South Jersey Families with Jersey Family Fun Facebook Community.